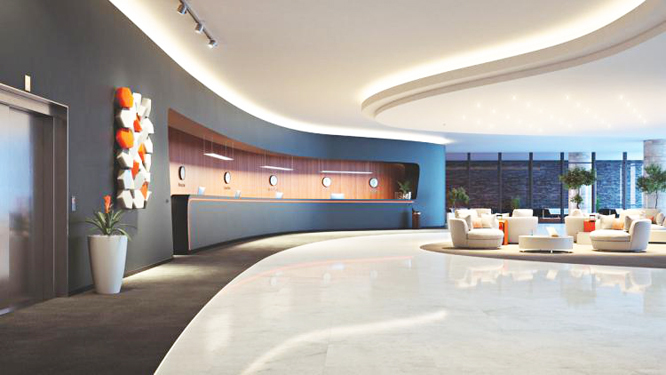 Flexible LEDs find a foothold in the signage market as fabricators navigate the latest lighting options. These 20 in. 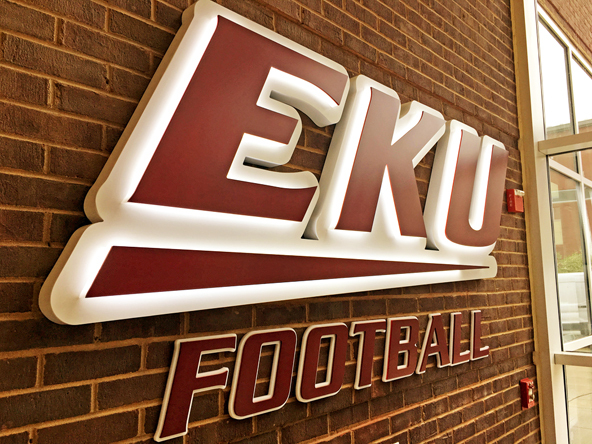 tall reverse channel letters for Eastern Kentucky University’s football program were fabricated by Integrity Sign Solutions (New Albany, IN) and instalLED by Instant Signs (Lexington, KY). The letters are halo-lit with Principal LED’s Qwik Tape technology. Richard Holzer, vice president of Xacto Signs , a custom sign wholesaler in Cleveland, remembers first observing LEDs in European airports back in the ’90s. “LEDs came first in Europe, then here [in the US].” said Holzer, who is French. “They’ve gotten brighter, and also smaller and smaller.” Within the world of LEDs exist flexible LEDs (meaning LED lamps mounted on a flexible substrate), which encompass myriad products and various interpretations of flexible LED classification. For instance, should flexible LED tubing that functions as neon tube lighting or neon replacement lighting be categorized under flexible LEDs? The answer lies in the eye – or diode – of the beholder, but for our purposes, products such as G2G Lighting’s Aurora Flex and Aurora Flex Mini are included. 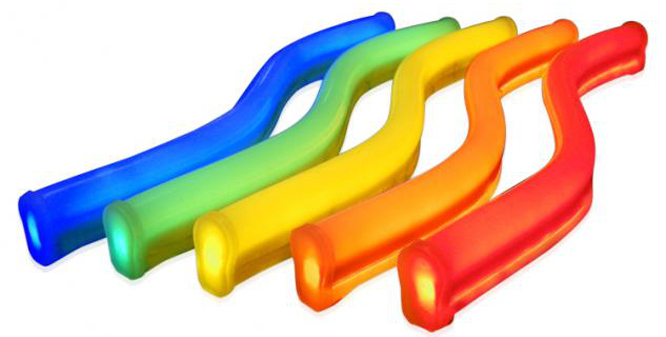 In addition to neon lighting, flexible LEDs can be sorted into linear border tubing (the LED is encapsulated or embedded inside a silicone or plastic tube) and tape lighting (with a “V” shape essential to its bending properties). Linear border tubing and tape lighting are created with different printed circuit boards (PCBs) and separate manufacturing processes. 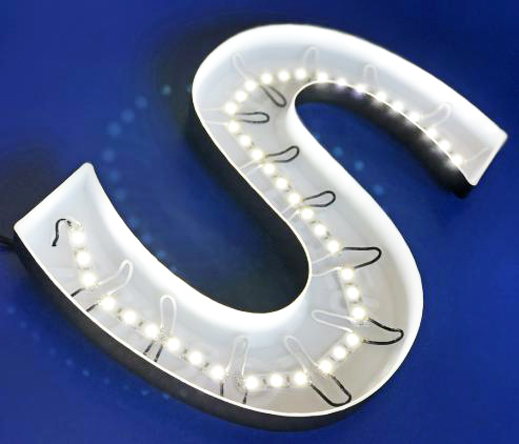 Possible applications for flexible LEDs range from lighting routed acrylic letters and channel letters (such as halo- or shallow-lit), to edge-lighting signage panels, to cove and display lighting. There are a handful of considerations when choosing the right flexible LED for your sign project, and the first of those is heat sinks/heat sinking. Heat sinks refer to the devices within LEDs that absorb and diffuse surplus heat away from the diode, as too much heat equates to lower light output, color alteration and a decline in LED life expectancy. Heat sinking issues can be solved at the production line – the better the manufacturing, the less it becomes a problem. A common issue with LEDs is hot spots, or areas of uneven brightness within a lit sign. This can cause LEDs to fail, and amplifies the need for proper distribution of the diodes within an LED. Hot spots can be caused by improper LED placement, power supply issues, and even the shape and depth of the sign itself. Halo-lit by Principal LED’s Qwik Tape, these 17 in. 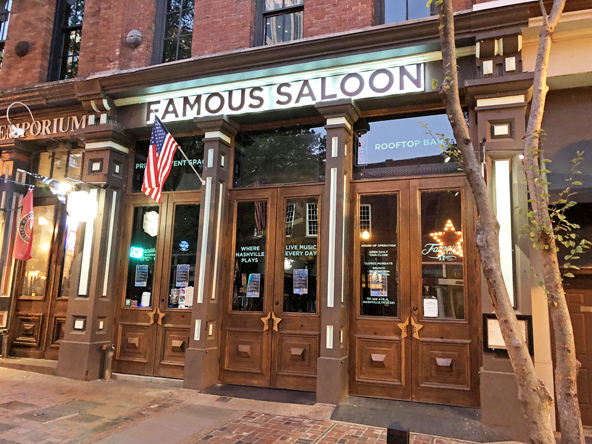 tall reverse channel letters for Famous Saloon in Nashville, TN were fabricated by Integrity Sign Solutions (New Albany, IN) and instalLED by ImageLife Signs & Graphics (Nashville). The good news for sign companies is that there is a diverse collection of flexible LED products available. The aforementioned Aurora Flex (270° beam) and Aurora Flex Mini (240° beam) from G2G Lighting are both IP-65 rated and have an output of 2.8W/ft. 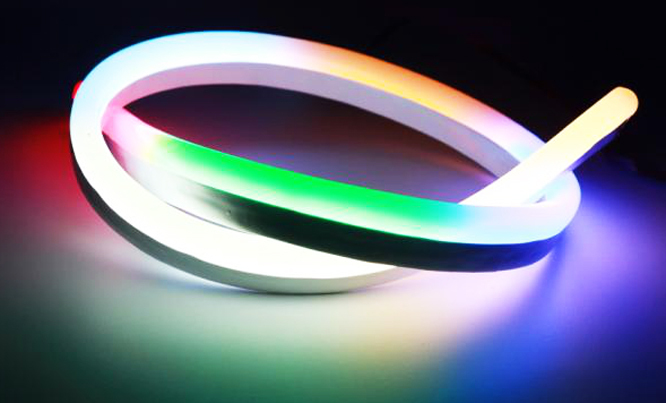 Flexfire LEDs provides many flexible LED options, including the ColorBright RGB 300 Color Changing LED Strip Light (120° beam angle, 4.4W/ft., available in 2- or 4-in. 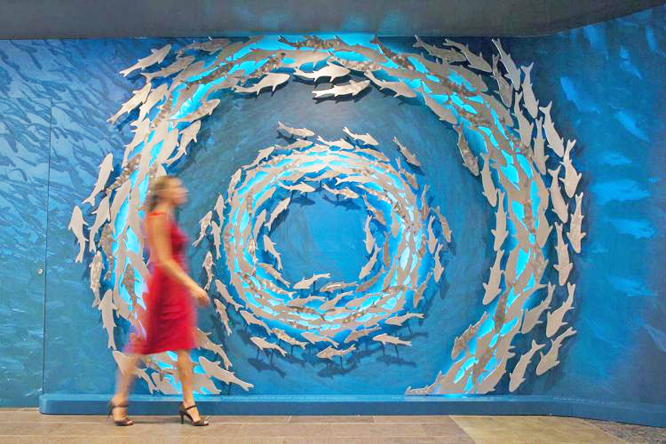 segments), which was used to illuminate the wall sculpture at The Florida Aquarium (Tampa FL) pictured on on pages 46-47. Bitro Group has its TRACER Series, a tape module that is bendable both vertically and horizontally, and is ideal for low-profile narrow channel letter lighting. The Tracer is sold in two models, the FT 5320 (3W/ft., 2.36 in. cutting increment) and FT3113 (2.6W/ft., 1.57 in. cutting increment), with both available in 18.9-in. strip lengths. International Light Technologies offers multiple flexible LED solutions, with its EZflx (IP-65 rated, 140° beam angle, cuttable every 1.5 in.) designed for low-profile channel letters, architectural letters and POP displays, among other applications. SloanLED has FlexiBRITE (IP-66 rated, 2.8W/ft.) 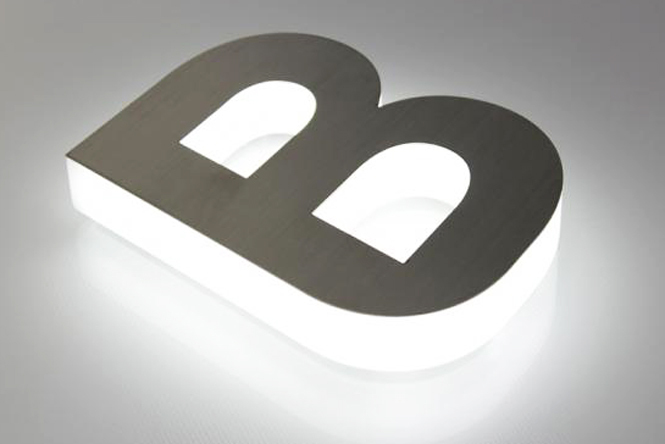 and BendLUX (120°beam angle, 4.2W per strip); the former provides a neon look and the latter is best for lighting acrylic block letters, shallow channel letters and backlit halo letters. Principal LED’s Qwik Tape Series includes the Qwik Tape Punch, which sports a 120° beam angle and 4W/ft. OSRAM’s LINEARLight FLEX (12 products) and LINEARLight FLEX DIFFUSE (four products) offer a variety of solutions. Be on the lookout for sequels to each of these products, which hopefully prove to be as good as The Godfather: Part II.